I can finally announce this - I've been published in Crochet World Magazine! The April 2011 issue was just announced and I'm in the feature called "The Winner's Circle". Note: the link points to the current Winner's Circle feature, so if you're just now clicking this link, you won't see my hat. You can view the pattern link in Ravelry. The pattern is called Garden Party Chapeau. This hat is crocheted with #3 crochet thread with a stiffener around the brim. I used nylon lawn trimmer line to stiffen the brim. Congrats on gettin published in such an awesome magazine :) The hat looks FABULOUS! Wow! Way to go Gene!!! I just saw this on Ravelry and had to jump over here to congratulate you for a job well done. FANTASTIC! Congrats on getting published! Very neat looking hat. Thanks, everyone. I'm really excited about this. It seemed to take FOREVER from concept to publication, and now I still have to wait for my copy to come in the mail! I'm doing this wonderful hat and wonder if you could help me with instruction or sketch of the TR SHELL stitch (Rnd 12[11,13]). Treble Crochet Shell (tr shell): 7 tr in indicated st or sp. I also am crocheting your wonderful hat and have a question, if you'd be kind enough to answer. I checked the gauge and my work seems to be just a bit larger than the gauge, but at the beginning of the first TR Shell round, it still looks way too small. Do you have any idea what the measurement across the top should be when starting the shell rounds for the different sizes? And I think they made a mistake when publishing the directions. Rnd 11 is shown as "Rep rnd 5" which is an increase rnd, but they show the number of ch 1 spaces at the end of the rnd to be the same as Rnd 10. I tend to crochet tightly, so I can understand how your gauge might differ using the same hook as designated in the pattern. Can I assume your stitch count is correct at the point you're having a problem? The published instructions differ substantially from those I submitted, so I will need to make the hat as published in the magazine in order to help you out with corrections. For example, in my instructions, Round 5 is not an increase round. Yes, my stitch count matches what is shown in the instructions. The only gauge they show in the magazine is that the first 4 rounds should measure 2" in diameter; mine measured about 2-1/2", so you'd think the end result would be a bit larger. So now after completing round 11 it measured 6" across, and then after round 12 it measures 7". Does that seem right? Oh, and I'm using the instructions for the adult small/medium size. It would be so nice to have an idea what the piece should measure before starting the TR shell rows. And I think the magazine just goofed and printed repeat rnd 5 when they meant rnd 4. Sigh, I've been trying to write out the instructions for an afghan I made, so I know how easy it is to make a slip. As rross said - I also saw that there was a problem with line 5 and 11, but I hoped it will turn OK and that there is a mistake with the ch-1 sps count. Unfortunately I had to un-stitch when reached to Rnd 16 because it turn much too big (I'm doing it for size adult large). I'll wait till I see the correction, please post here a note about that. I also ask if you can give some measurement of the white upper part of the hat before changing to color A in size adult large so I could have some indication that second time it will go OK. I was so amazed by the beauty of the hat that I started knitting without measuring and kept on "hoping" it will get a long. But when I realized something is wrong I was so upset (sorry Gene, not at you :-)) that I unstitched it totally. I must restart it from scratch anyway if I want to make it right. When we'll have the correction I'll start again and contact you so we can compare. Thanks for the kind thought. Regards, Daphna. No need for apology, Daphna! I can't do much more on the hat till I get the rest of the thread anyway! (Had to order some of the colors I wanted.) But maybe we can compare notes along the way. It is a beautiful design, isn't it? Using the hdc dec stitch as the main stitch is something I'm not familiar with, so it took some very careful reading to get it going, but I love the look of it! any news about the correction? In comparing the pattern from the magazine with my original pattern, I notice they reversed round 4 and 5 from my pattern. There is no change to the number of ch 1 spaces by the time you begin the tr shell round. Therefore, the instructions to repeat round 5 should refer to round 4.
is this the only correction in the magazine pattern? That's the only correction I've noticed. They DID change the verbiage of the instructions that I submitted, but so far, that's the only correction I've found. It could be my familiarity with the pattern that may have led me to miss something, though. I'm working on a hat for a friend (in all black thread!) from the magazine for adult large. My measurement for the row (row 12 for this size) before the first shell row is 5 1/2 inches, although I am using a larger hook for the larger hook (2.5 mm versus 2.25 mm). The measurement after round 4 with this larger hook is 2 1/2 inches - although I didn't measure it until after row 12, if that makes sense. I'm putting the hat on a mannequin for the measurement to eliminate any correction due to ruffling as it doesn't lie flat. 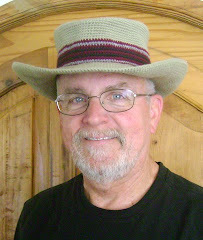 I came in search of you after reading this article in CW :) Your hat is amazing! LOVE IT! I look foward to seeing more! Thanks so much for looking me up and for the nice comment. You are very kind - thanks! I made your hat for a friend's daughter who has cancer - she LOVES it. I had to raid my brother-in-law's shed for some trimmer line - he thought I was nuts when I told him what I wanted it for. LOL Looking forward to more projects from you! Thanks so much for the nice note. I was very pleased when I discovered the trimmer line solution to keeping the brim in place. Come and see the hat i did following this pattern. I gave it to my mother-in-law and she is very please with it. see pictures in :http://ravel.me/vamdaph/ru0h0 . The hat is full of summer. Thanks for sharing your beautiful project. Hi, this is a pattern I would love to work out but I can't get started. As Customer Care shows there are numerous errors in the digital version. Is there also an error in Round 2. How do you make HDC dec's without HDCs to start off with. When the magazine bought my pattern, someone decided to change it a bit. My version does not mention the hdc dec, for example. That aside, to make an hdc dec you don't have to have an hdc stitch in the previous round, just a stitch. The hdc dec: yo, insert hook in loops of same stitch just worked of previous rnd, pull up a loop, yo, pull up a loop in next st, yo and pull through all loops on hook. Note that since the stitch is started in the loops of the same stitch just completed, there is no "decrease". I refer to this procedure as "hdc2tog" or half double 2 together. It was sweet of you to reply. Looks like I may have to buy your pattern if I wish to do the hat since my digital subscription to Crochet World began around three months ago and the errors in back issues may be deliberate. The bigger challenge for an Asian subscriber is not the design but sourcing yarns. Can the hat be done in DMC Senso yarn? Thanks. Marilyn - I don't own the pattern any more since the magazine bought all rights to it, but I am working on a design inspired by this one. As for using other crochet thread, I'm not familiar with the DMC Senso yarn, but as long as the size is the same, there should be no problem. Naturally, I'll be posting the results of my new pattern here. The repetitive actions needed for knitting and crochet can bring the mind and body to a state called a "relaxation response" that is quite similar to what people experience with techniques such as repetitive prayer, yoga, meditation, Tai Chi, and other relaxation disciplines. Research at the Harvard Medical School Mind/Body Institute has found that when an individual is crocheting (or knitting) his/her heart rate can drop 11 beats a minute and his/her blood pressure drops as well. These results can have significant health benefits for people who knit and crochet. Therefore, I am a man who crochets. I design my own crochet and sell patterns and finished projects.